Given the difficult economic climate, the cost of routine eye exams and prescription eyewear can be of concern. In many cases, vision insurance can lower these annual expenses. If you do not see your medical insurance listed here, please call and speak to our receptionist about coverage, as this list is not all inclusive. We will be happy to do a complimentary benefits check and answer any questions. In order to assist in processing your insurance claim, we ask that you bring both your vision insurance card and your medical insurance card to your examination. Some services provided in our office may apply to your medical insurance. Our optometrist in Indiana, PA will do everything possible to ensure maximum payment of benefits from your insurance company, however, the patient is responsible for amount not paid by insurance. To help avoid unnecessary expenses, please be prepared to pay your bill or insurance co-pay at the time services are rendered. 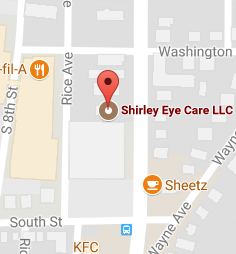 As a service to our patients, Shirley Eye Care is pleased to offer the CareCredit card, the nation’s leading patient payment program. CareCredit lets you begin your procedure immediately; then pay for it over time with low monthly payments that are easy to fit into your monthly budget.